Dr. Martinez seemed rushed throughout my appointment. I don't know if she felt she didn't need to explain things thoroughly because she knows I'm a nurse. I asked for a referral to see an allergist (which I got) but she was walking away from me as I was talking to her. Very professional and concerned about my weight loss. Dr. Martinez is great! Receptionist and Medical assistants are always very nice and helpful. This is the first time and I am glad I came to see Dr Martinez. Honestly overall I was pleased with the visit, however the provider was undermining any questions & concerns I had because she was relating everything to my weight ignoring any other possible reasons. Primary reason for visit was for extreme foot pain due to a previous injury (over a year ago). I have been dealing with the pain and it has gotten worse. X-ray was ordered and told to continue the same treatment I have been doing for the last year. Recieved a result of the X-rays but no other treatment was given, nor was I told what the following steps for care were. The pain is still present and I was really hoping that after the X-ray, something would have been done to help in providing relief for the pain since it makes everyday tasks difficult. I'm satisfied with service provided by the clinic and the Doctor, however, I'm disappointed that there hasn't been anything done to alleviate my pain. It was not a good experience. I did not feel comfortable. I liked the service very professional from the doctor. As a new patient, very good experience, good personnel, good attention. Very good, she made me feel comfortable. Doctor Estella Martinez is an excellent doctor. The provider followed the training that works under system that's setup. No way or authority to practice in the direction that the patient feels best for them. Basically, follow orders type practice. had back pain it was the second visit for this issue and she gave me new med. I Estela for the moment I feel good with my doctor. Estella Martinez is a very good doctor for me for the moment she is a very pleasant person & nice person. Very good and clean office, excellent service. Well sometimes I forget to the nurse about other problems that I have so she can put it on the computer and when the dr. comes I tell her and she doesn't want to attend that problem I need another appointment and sometimes there isn't any appointments for lack of doctors sorry. Excellent. the best doctor ever. My provider was knowledgeable, and compassionate. I do not like her. she has listed me as seeking drugs when I have been prescribed the same drug for over 15 yrs and am dropped in amounts & milligrams when I count on the medication to function properly, I feel it is wrong & inconsiderate. Dr. Martinez is great. I like her holistic approach to medicine. looking at the foods we eat that could help improve overall mental health. like that she speaks Spanish and is very understanding. receptionist and MA were very nice and helpful. A very nice and friendly doctor. Staff and doctor treat us with courtesy. My best experience was to go to that clinic - to know the people - A1. I liked their attention a lot, very professional. The doctor was good but did not return any of my phone calls. She told me to call on certain days I did but could not talk to her. To date I still haven't. I HAVE JUST STARTED SEEING DR MARTINEZ IN THE LAST FEW MONTHS. SHE IS VERY THOROUGH. SHE TAKES TIME TO EXPLAIN AND TO ALSO LISTEN. SHE DOES NOT SEEM RUSHED WHEN SHE IS WITH YOU. EXCEPTIONAL SERVICE. Dr. Martinez Estella I liked because she speaks Spanish & I can communicate with her in my language. Excellent doctor and excellent service. Very good a good experience. Dr Martinez made me feel very comfortable and was very detailed in her questions to make sure I received the proper care. she personally called me to come into the to office for a follow up and discuss results which were abnormal. She was very kind and caring and expressed herself in a way that made me feel as if she has been my doctor for a long time. The office staff was also very pleasant and efficient with arranging labs and other appointments. My experience at this office has been all around great and would highly recommend this doctor and this office to my friends and family. 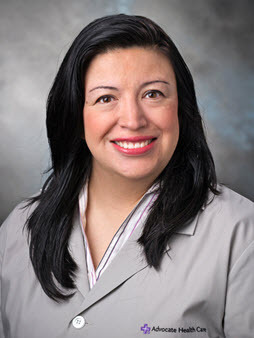 health eNews with Estella F. Martinez, M.D.